What is it? You might recognize barley as the small, white, oat-like discs found floating in your bowl of canned soup. The whole grain has been grown for centuries, used to make foods and wines in many cultures. Barley even holds a place in history as the first unit of the English measurement system: King Edward II decreed an inch to be equal to three grains of barley. What is it good for? Barley is a king among whole grains when it comes to fibre: A 100-gram serving of cooked, pearled barley contains 15% of your daily recommended intake. Along with that, you'll also get many other nutritional benefits, including about 5% of your needs for protein and magnesium. Barley is also a very good source of the mineral selenium, which has been linked to improved fertility, most notably for men. 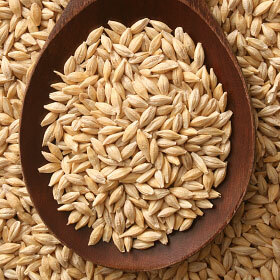 Since it is a type of wheat, barley is not a safe choice for those following a gluten-free diet. What does it taste like? When you eat something containing barley, you will note a rich, nutty flavour and a slightly chewy texture. Barley can be blended into recipes for breads and muffins or added to soups and stews as a thickener. Prepare cracked barley or barley flakes in the same way you would oatmeal or porridge for a filling hot breakfast cereal. Or use hulled, cooked barley as base for a fresh, chilled veggie salad. Barley keeps best when stored in an airtight container that is placed in a cool, dry spot. You can also store barley in the refrigerator.